Fatty Liver? Treat it with these homeopathic remedies. Sensation of fullness in the abdomen. If not treated it may lead to cirrhosis of liver which may present with yellowish discoloration of skin, weight loss, nausea and vomiting, itching all over the body ,easy bleeding, abdominal distention due to accumulation of fluid in abdomen. Fatty Liver Disease has a tendency to progress further. If left untreated it may cause irreversible liver damage. Homeopathy treatment can help to check the progress of disease thus preventing further damage to the liver. It can help to improve the Liver Function. Following are the list of medicines which are used in Fatty Liver Disease. Lycopodium acts on deep seated chronic diseases. It is used in gastric affections where there is accumulation of gases. There is bloating sensation. There is fullness in abdomen which is not relieved by belching. It is also used in constipation where there is ineffectual urge for stools, developing piles. Chelidonium is a prominent liver remedy. The skin has a jaundiced appearance .There is general lethargy and indisposition to make any effort is also marked. Pain through stomach , to back and right shoulder blade .Gastralgia .Eating relieves temporarily, especially when accompanied with hepatic symptoms. The action of this remedy is centered in the liver, portal system. There is pain in the region of liver .There is fullness and soreness in abdomen. Jaundiced skin. There is bitter taste in mouth. Appetite is reduced. There is nausea and sour vomiting. 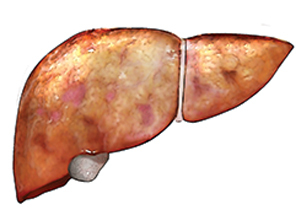 Read more about fatty liver in our blog: Do I Need to Worry About Fatty Liver? Nux Vomica is the remedy especially adapted to digestive disturbances. There is sour taste in mouth. It is used in nausea especially in he morning after eating. Bloating sensation. Bruised soreness of the abdominal walls .Pain in abdomen which causes shortness in breath and desire for stools. The abdomen is distended. Bryonia is a very useful remedy in case of liver diseases. There is soreness and tenderness so much so that he cannot move. Every motion causes pain in abdomen, The breathing is short, quick. It is indicated for stitching pains and burning pains in the liver .The stomach is distended with gases after eating . Homeopathy prescriptions are made after thorough case taking and individualization. So it is advisable to consume them under professional advice. For further guidance you can get in touch with us at info@lifeforce.in or call on + 91-22-66888888. – Dr. Kainat Saud Moosa , Associate Doctor to Dr. Rajesh Shah,Team Life Force.